If you have an Office 365 subscription along with a subscription to Project or Visio, and you want to upgrade your installed programs to the latest version, you'll see the following dialog box when you start the upgrade process. 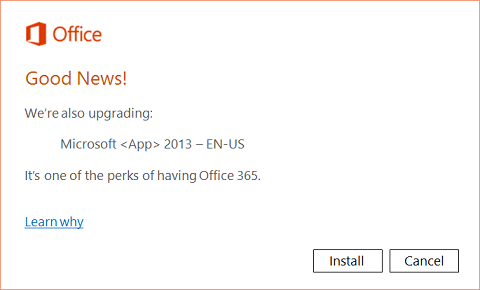 The Office 365 upgrade process will upgrade both your Office 365 core apps, such as Word, Excel, or PowerPoint, as well as your Visio subscriptions. You won't have to upgrade those applications separately.